Protein Blend (Whey Protein Isolate, Micellar Casein, Milk Protein Isolate, Egg Albumen), Nondairy Creamer (Sunflower Oil, Corn Syrup Solids, Sodium Caseinate, Mono- And Diglycerides, Dipotassium Phosphate, Tricalcium Phosphate, Soy Lecithin, Tocopherols), Natural and Artificial Flavors, Guar Gum, Acesulfame Potassium, Sucralose, Lecithin, and Silicon Dioxide. 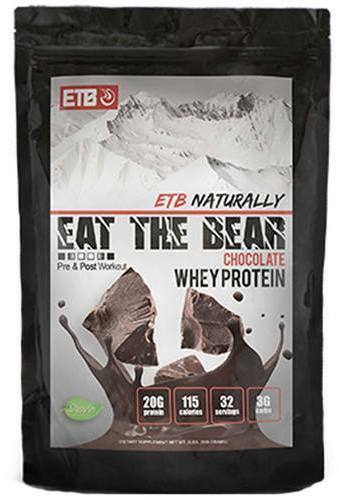 Add one level scoop of ETB Naturally to 8 fl. oz. of cold water, non-fat milk, juice or yur favorite beverage. Adjust the amount of liquid to meet your desired taste and consistency. Shake, stir or blend until dissolved. NOT RECOMMENDED FOR INDIVIDUALS WITH ALLERGIES TO DAIRY PRODUCTS AND SHOULD NOT BE USED BY PREGNANT OR NURSING MOTHERS OR CHILDREN UNDER 18 YEARS OF AGE WITHOUT THE ADVICE OF A PHYSICIAN. EXCESSIVE PROTEIN INTAKE MAY RESULT IN IMPAIRED KIDNEY FUNCTION. KEEP OUT OF THE REACH OF CHILDREN. DO NOT USE IF SAFETY SEAL IS DAMAGED OR MISSING. STORE IN A COOL, DRY PLACE. Non-GMO Whey Protein Concentrate, Natural Flavors, Xanthan Gum, and Stevia. 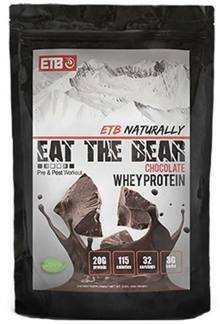 Add one level scoop of ETB Naturally to 8 fl. oz. of cold water, non-fat milk, juice or your favorite beverage. Adjust the amount of liquid to meet your desired taste and consistency. Shake, stir or blend until dissolved. Not recommended for individuals with allergies to dairy products and should not be used by pregnant or nursing mothers or children under 18 years of age without the advice of a physician. Excessive protein intake may result in impaired kidney function. Consists of whey from grass-fed cows free of recombinant bovine growth hormone (rBGH). ETB stands for “Eat the Bear.” A friend of ours who was diagnosed with Leukemia a number of years ago used to say during challenging times that ‘Some days you eat the bear, and some days the bear eats you.’ As a constant reminder that we are in control of our lives personally, physically and professionally, we continually remind ourselves to ‘Eat the Bear’ every day without exception! Chocolate This is a Buy 1 Get 1 FREE offer! Vanilla This is a Buy 1 Get 1 FREE offer!